I had absolutely no idea what was supposed to happen when I first saw this control panel. The main problem was that THERE WAS NO TEXT. I greatly admire simplicity in iconography, but images need to have relevance to the user. 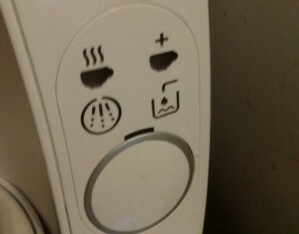 A stick figure pushing a mop says cleaning to me, but can you guess which icon means cleaning on this control panel? This button means the coffee maker is in automatic mode. It does have some wavy lines to indicate heat coming off of coffee, but this is an end state. What I would have preferred was an icon that looked like coffee was pouring into the mug. This indicator means the machine's manual mode had been engaged, which allowed the user to override the auto process and adjust the flavor to their liking. The '+' symbol gave this icon a little more context. This was the easiest icon for me to decipher, the "water level low" indicator. The primitive faucet shape, container outline and characteristic drop plus wavy lines make this icon very rich in character. 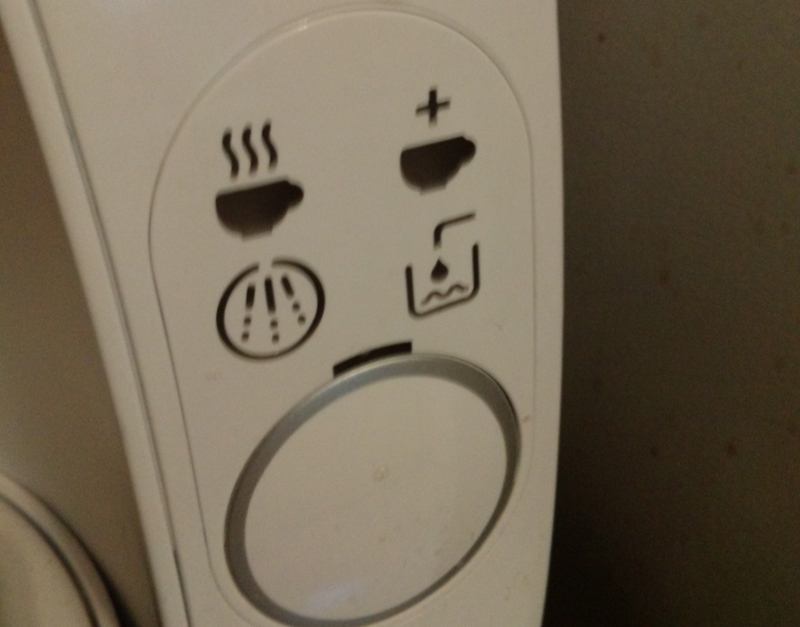 This icon apparently means "descaling" is needed. That's what it says in the manual, which just adds an unnecessary layer to my understanding. If the manual just said "cleaning" I would get the meaning right away. Product designers should avoid unnecessary jargon whenever they can, whether it be on the machine or in the literature. I probably would have been better off NOT looking at the manual. My biggest problem with the control panel is that there is only one button without any text or an icon of any kind. 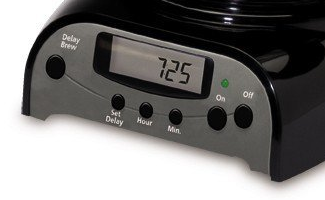 The power switch turns the machine on, but then the START/STOP button has to be pressed to begin the brewing process. The signal that the brewing process is ready to begin is the wavy coffee cup turning green. When I first tried using the machine I instinctively tried pressing the START/STOP button immediately before the machine was ready (after the disc containing the coffee is loaded, the machine must read a label using a barcode scanner and prepare itself). Place a light in the middle of the START/STOP button or perhaps make a lighted ring around the START/STOP button. Even changing the stand by light above the START/STOP button so it glows green when the machine is ready would be helpful. Many users, including myself, would likely be less inclined to try pressing a button that is red. Subdivide the icons with some additional iconography to indicate COFFEE and MAINTENANCE. COFFEE could be represented by a coffee icon like it is now, and MAINTENANCE could be indicated by a wrench or similar item. Eliminate the FILL WATER icon entirely. The only reason I can see for including this icon is that the tank is on the back of the machine and the product designers figured it would be a better UX if someone didn't have to actually turn the machine or look to see that the water needed replenishment. The "one-button" design goal is admirable, but the START/STOP button is doing at least three things here: START, STOP, and INITIATE MANUAL MODE. This is "button overload" in my opinion, a consequence of dictating the UI of the machine according to aesthetic considerations rather than functional ones. I would have included sufficient buttons to provide a solid UX before addressing aesthetic concerns. If manual control of beverage strength was desired, allowing the user to specify this and store it would have been a good way to preserve the "one button" design. There would be other buttons, but the "one button" becomes the button that MAKES THING HAPPEN instead of the ONLY BUTTON on the machine.